Glittering Prizes for Sober Buildings | "Global Possibilities"
It’s not enough to be pretty any more. Now you have to make a difference to get the top recognition in architecture. It is no longer enough just to make a pretty building to win the glittering prizes. That is the message that is by now evident from the past year of architecture awards, which have gone mostly to those who combine either social activism or the use of innovative technology—and occasionally, but rarely, both—with good design. To hammer home the point, this design does not always have to lead to the construction of a stand-alone building, either. Two of the last three Pritzker Architecture Prizes went to designers (Alejandro Aravena and Balkrishna Doshi, Hon. FAIA) who know how to create breathtakingly beautiful objects but who also use their skills to address issues of how to provide housing for those who can’t afford it, how to design social catalysts, and how to introduce working methods into architecture that students might not have been taught in a standard school. At the same time, the P/A Awards this magazine manages and the Museum of Modern Art’s Young Architects Program, which leads to the construction of a temporary summer structure at their PS1 location in Queens, highlighted young designers working with new techniques and technologies, especially in presentation. My favorite of all of the recent competitive hot spots, however, is the MCHAP.emerge (Mies Crown Hall Americas Prize for emerging architecture) award, a biennial prize for emerging designers that is the companion prize to the MCHAP award given to “the best realized works of architecture in the Americas.” This year’s MCHAP.emerge winner has not yet been announced, but that does not really matter, because all four finalists represent directions that architecture should be exploring to their fullest potentials. The list also highlights the fact, already hinted at by the Pritzker winners, that the best work is taking place not in this country, but in what we used to call the Third World—and more and more, specifically, in South and Central America. and Estudio Macías Peredo Arquitectos. 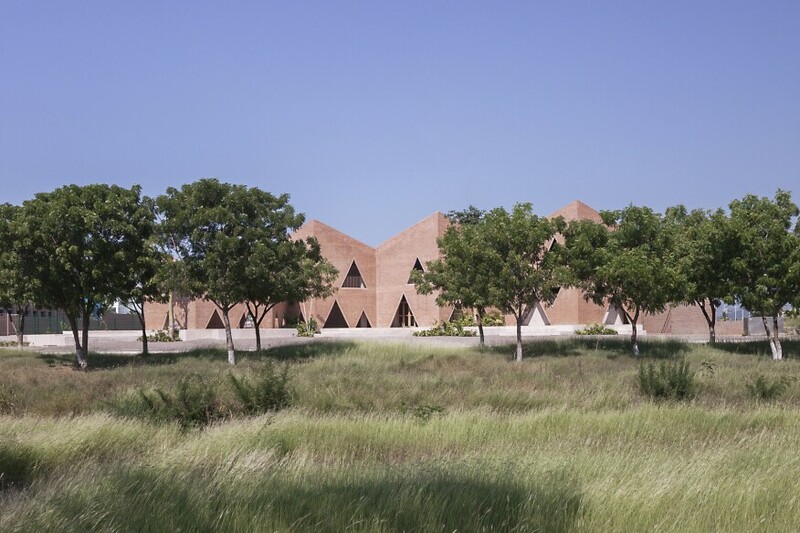 A compact collection of two-story hexagons made of hollow brick with a concrete structure, its great virtue seems to be that it creates a village of forms rotating around open courtyards and sheltering the classrooms. This makes for cooler places to gather and move within the school’s deep skin, which blocks the region’s strong light. The design’s signature triangular openings encourage breezes and light to enter, and the shape illuminates the interiors with the light that bounces up from the ground rather than what comes down from the sky. The “ludic geometry,” as the architects describe it, allowed the project to be built in stages and to avoid appearing as a monument. It is, in other words, not an object, but a playful assembly of forms that undress themselves in front of us. 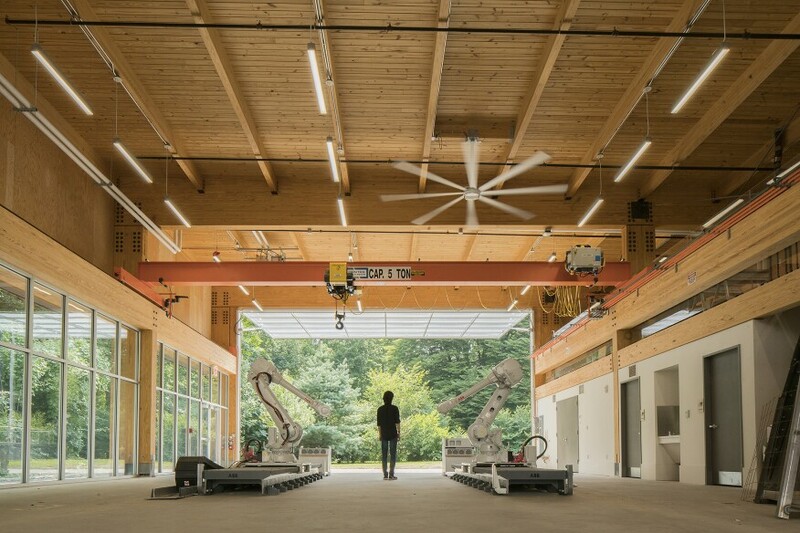 Next is the only project in the United States: the Embodied Computation Lab at Princeton University, designed by David Benjamin and The Living. Its virtue is both its simplicity and the fact that its cladding consists entirely of recycled wood. A room that opens up to the outdoor with the help of a garage door clad in translucent plastic, the lab is a basic box, but one with beautiful proportions and a lack of pretense. 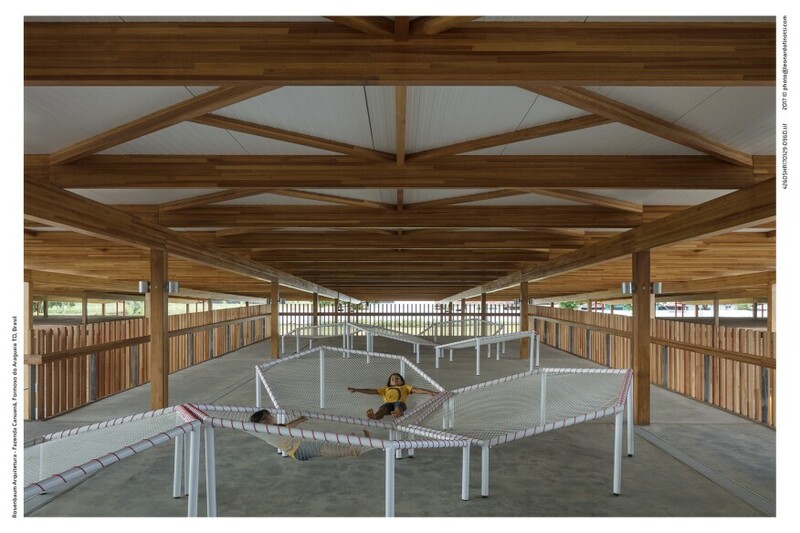 Much larger and more intricate is the Children Village in Formoso do Araguaia, Brazil. 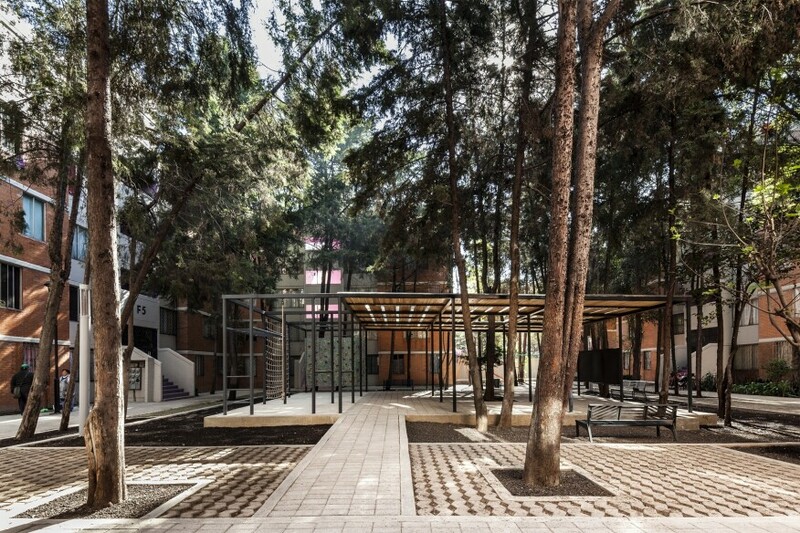 Designed by Aleph Zero and Rosenbaum, it consists of eight dormitory blocks (four each for boys and girls) around two courtyards under a gently sloping roof. Located in the Brazilian savannah, this structure, like the one in Mazatlán, opens to the environment with shaded breezeways and courtyards. Its rooms are Spartan, but what matters is the shared spaces for play and learning that the architects created using the blocks and defining elements. A lattice structure of local wood, reinforced where necessary with steel, creates the appearance of a village of scrims and screens. But to me, the most interesting of all these projects is the last one, a project that is resolutely not a building in the traditional sense. It’s a series of courtyards in the middle of social housing project in Mexico City, designed by Rozana Montiel Estudio de Arquitectura. The project is part of a concerted effort by Infonavit, Mexico’s social housing lender and manager, to upgrade the quality of both existing and new projects. In this, they are concentrating as much on the building’s exteriors and surroundings as they are on basic amenities that all of the inhabitants, regardless of their socio-economic status, deserve. The lender has hired famous architects such as Alberto Kalach, but then tasked them with park renovations and open-air social structures. Such is the case in this complex on San Pablo Xalpa Avenue. Montiel took areas that were left over and underused, filled with trash and lean-tos, and used the simplest of means to turn them into places for the community. New paving, raised off the ground, provides a safe and easy-to-clean surface. Steel structures with corrugated metal roofs offer shade. A small library has brick walls, but remains open to the outside. There are places to play, complete with swings; verandas where the inhabitants watch movies on warm nights; and semi-outdoor rooms to learn. The design is open, flexible, very economical, and variable according to its location and need. In addition, it still appears to provide a variety of different spaces and visual anchors that is astonishing in its effect. I will write more about Infonavit’s program in upcoming articles, but I want to note here that the quality of design that they are putting into places that are almost always devoid of anything approaching architecture is astonishing and worthy of our attention. The fact that so much of their focus is not on enclosed structures, but on the frames that connect us, the spaces where we become communities, and the images that allow us to understand where and who we are is all the more praiseworthy. Let’s face it, the United States is falling behind. It seems unable to invest in its infrastructure—or to create decent places to live, work, and play for the 98 percent who can’t afford its glittering high-rises and culture palaces—and it is destroying its landscape while it uses up its resources. We should look to South and Central America, where decades of tactical urbanism, innovative solutions for building with no money, and a concentration by some of the best architects on how they can make their environment and society better is producing the kind of results of which we can only dream. The results are as much open spaces as they are buildings, as much tactics as they are solutions. To be a good architect, go south. Aaron Betsky is a regularly featured columnist whose stories appear on this website each week. His views and conclusions are not necessarily those of ARCHITECT magazine nor of the American Institute of Architects.